Aerosol spray cans: Are they now safe for the environment? Aerosol spray cans were created in the 1920s by U.S. Department of Agriculture.scientists for the purpose of pressurizing insect spray. During World War II, the technology was used by American soldiers to prevent malaria in the South Pacific.. The original cans were large and clunky. In the following decades, they became more compact and more refined. They also became very popular with consumers, although they contained chloroflurocarbons (CFCs). CFCs are non-toxic, nonflammable chemicals. These chemicals are composed of atoms of carbon, chlorine and fluorine, which deplete the ozone layer, a region of the Earth's atmosphere which absorbs most of the Sun's ultraviolet radiation. In effect, the ozone layer acts a protective shield, which CFCs destroy. The environmental danger posed by aerosol cans first came to public attention in the 1970s. In fact, there is an episode of the American TV series All in the Family (1971-1979) in which Mike "Meathead" Stivic informs his wife, Gloria, about how her aerosol hair spray damages the ozone layer. 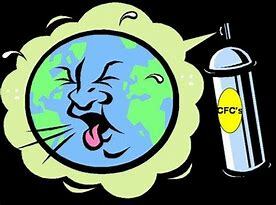 In the late 1970s and early 1980s, the United States, Canada and other countries banned ozone-depleting CFC propellants for non-essential uses. This action reduced CFC consumption in Canada by more than 50 per cent. In the United States, consumer aerosol products have not contained CFCs since the 1970s because companies eliminated them voluntarily. Federal regulations such as The Clean Air Act, and United States Environmental Protection Agency (EPA) restrictions, further limited the use of CFCs for non-consumer products. Due to the landmark Montreal Protocol of 1987, an international agreement signed in Canada by 191 countries, many nations began phasing out ozone-depleting propellants and replacing them with non-depleting forms. In 2014, five international organizations, including the United Nations Environmental Program and NASA issued a report that concluded that actions "taken under the Montreal Protocol have led to decreases in the atmospheric abundance of controlled ozone-depleting substances, and are enabling the return of the ozone layer toward 1980 levels." Unfortunately, this does not mean that the problem has been completely solved. It also does not mean that hair sprays, deodorant and shaving cream cans are favourable to the environment. 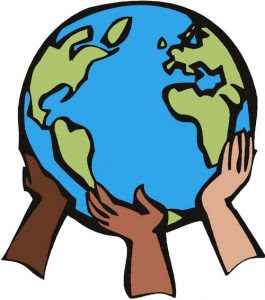 Even without CFCs, aerosol sprays and aerosol cans still contain hydrocarbons and/or compressed gases known for contributing to global warming. Even though hairsprays no longer uses CFCs to propel the stiffening agreement out of the can, they do contain other chemicals as propellants that are considered to be potent greenhouse gases - namely hydrofluorcarbons (HFCs. The previously mentioned 2014 report found that "climate benefits of the Montreal Protocol could be significantly offset be projected emissions of HFCs used to replace " ozone-depleting substances. Although HFC use "makes a small contribution" to greenhouse gas emissions each year", the authors of the report asserted that HFC emissions "are currently growing at a rate of about 7 % a year." Growing demand could possibly result in HFC emissions reaching levels "nearly as high a the peak emission of CFCs" by the year 2050. According to Scientific American, modern-day aerosol sprays also "emit volatile organic compounds (VOCs that contribute to ground-level ozone levels, a key component of asthma-inducing smog." It's not only aerosol sprays that emit VOCs. The list includes fingernail polish, perfumes, mouthwashes, pump hair sprays and roll-on and stick deodorants. Sadly, it is difficult for the public to be properly informed when the current President of the United States, makes false claims. Donald J. Trump is no friend to the environment. He doesn't take climate change seriously, nor is he concerned with scientific evidence that the Earth is heating up at an alarming rate. He also pulled the United States out of the Paris climate change agreement and he actively encourages the use of non-renewable resources. So, it is not surprising that Trump has spread misinformation about hairspray and its effect on the ozone layer. The president is apparently quite familiar with the use of hairspray by which he achieves his strange hairstyle, a blond combover look. A former political adviser to the president told the New York Post that Trump "uses a weird bottle of hairspray." that's "bigger than the biggest can of beer." On May 5, 2016, at a campaign rally in Charleston, West Virginia, Donald Trump declared that "hairspray's not like it used to be" because chemicals in it that affect the ozone layer have been banned. He also claimed that using hairspray in his apartment, "which is sealed," would stop any ozone-depleting substances from escaping into the environment. Yet, according to an article by Vanessa Schipani in The Wire, multiple exports told her that the chemicals would still make their way out. At the rally in Charleston, Trump was presented with a hard hat from an official from the West Virginia Coal Association. After trying on the hat. Trump couldn't resist talking about his hair and he implied that regulations on hairspray and coal mining are unnecessary. Trump, May 5, 2016: Give me a little spray. … You know you’re not allowed to use hairspray anymore because it affects the ozone, you know that, right? I said, you mean to tell me, cause you know hairspray’s not like it used to be, it used to be real good. … Today you put the hairspray on, it’s good for 12 minutes, right. … So if I take hairspray and I spray it in my apartment, which is all sealed, you’re telling me that affects the ozone layer? “Yes.” I say no way folks. No way. No way. That’s like a lot of the rules and regulations you people have in the mines, right, it’s the same kind of stuff. By the way, back in 2011, Trump suggested that the "eight-inch concrete floors" and "eight-inch concrete walls" of Trump Tower would prevent hairspray from "destroying the ozone that's 400 miles up in the air." Not so, said Steve Montzka, a chemist at the National Oceanic and Atmospheric Administration. "It makes no difference," he stated, if you spay those chemicals "inside your house or apartment. It will eventually make it outside."